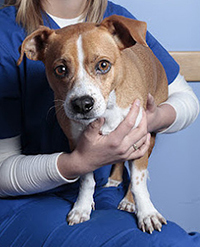 At Greenpoint Veterinary Hospital in Brooklyn, we understand that your pet is special to you and that within this ceaselessly moving and sometimes chaotic city he or she provides you moments of warmth, calm, and unconditional love. It is our goal to do everything we can to strengthen your human/animal bond by maintaining the health and well-being of your pet while treating you with the respect you deserve. Our veterinary hospital is fully prepared to diagnose and treat any health concern that should arise. Our facility is fully computerized and offers digital x-ray, ultrasound, digital video microscopy, and digital video otoscopy. We also have in-house blood chemistry testing capabilities that can give results in 30 minutes. Our advanced diagnostic equipment can quickly provide the answers we need to understand your pet's medical issue. Once a diagnosis is made, our internal medicine expertise and modern surgical resources stand ready to treat or manage your pet's illness or injury. We will care for your pet as though it is our own. We believe in tailoring health care options for your pet's needs. We will confer with you about the different treatment options available—we are your partner in the health and well-being of your pet. If your pet is not in need of any immediate medical treatments, our focus will be on maintaining optimum health through wellness care and preventive medicine, and by speaking with you on how to avoid future health issues. On the lower tech side, we have fresh baked cookies every morning and a coffee station to provide you with a little treat during your visit with us. We are a team of professionals that are committed to providing your pet with the best that modern veterinary medicine has to offer within a facility that is safe, welcoming, and convenient.